Ferdinand Bol trained in his native city of Dordrecht with Jacob Gerritsz. Cuyp and continued his apprenticeship in 1637 with Rembrandt in whose studio he copied works by his master, among other tasks. Throughout his career Bol executed religious, history and mythological paintings as well as portraits. His first known works date from 1642 and his output until almost 1650 was strongly marked by the influence of Rembrandt. From the 1650s his style became more elegant with a use of pale tones and a classicizing atmosphere. Bol received important commissions throughout his career, including the decoration of the new Town Hall in Amsterdam, whose construction began in 1648. 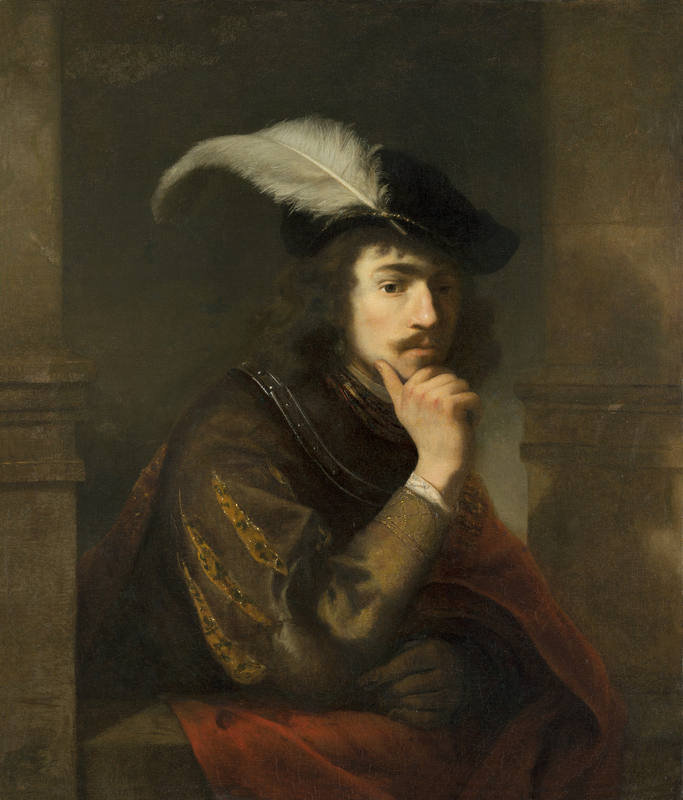 The present canvas was dated by Blankert to around 1647 and by Sumowski to between 1646 and 1647, a phase in which Bol’s work was closely dependent on Rembrandt. The composition has been compared to two self-portraits by Rembrandt, an etching of 1639 and a canvas in the National Gallery in London dated 1640. In the London work Rembrandt depicted himself half-length, turning his head to look at the viewer and resting his right arm on a ledge. The influence of artists such as Raphael in his Portrait of Baldassare Castiglione (Musée du Louvre, Paris) and Titian in Man with a blue Sleeve(National Gallery, London) has been widely noted by critics as the inspiration for Rembrandt’s image. Another precedent is the portrait by Nicolaes van Bambeeck in which the model is located in an architectural setting. In the present panel, the young man is richly dressed with a splendid pearl earring in his right ear. The colours used to construct the figure are almost monochrome apart from the strong red of the cloak that falls over the ledge, the white of the feather in the cap and the pale flesh tones. This type of depiction, with a ledge in the foreground on which the sitter rests his hands or arms, was used by Bol in the second half of the 1640s. It includes an innovative element in the gesture of the hand resting on the chin. The present canvas, of which there is a copy in Wawel castle, Cracow, had a false signature of Rembrandt and a date of 1637. It would seem that this was relatively common practice as a number of paintings by followers of Rembrandt have had false signatures added to them. This problem in relation to Bol’s oeuvre was emphasised by Michel in 1893. The painting was attributed to Bol by Bredius and by Hofstede de Groot and was included in the monograph on the artist by Albert Blankert, who dated it to between 1644 and 1650.